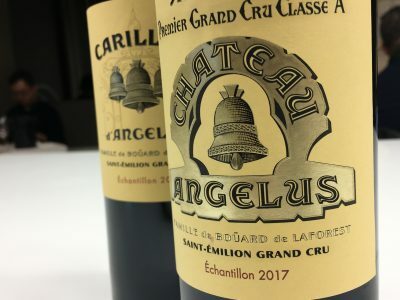 Château Angélus has made vivid, beautiful wine in 2017. The property reports that only a small part of the vineyard was affected by the April frosts. The remaining fruit benefited from the consistent weather during flowering and the hot June spurred vine growth. The vitality of the wine owes its origins to the dry but coolish summer, which helped the grapes retain freshness and acidity, as well as bright aromas. The relatively precocious state of the vineyards unaffected by frost meant that the vintage was relatively early, somewhat encouraged by the rainy period in September. Carillon d’Angélus also looks impressive in 2017. 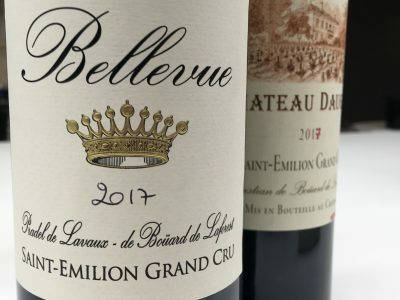 Château Bellevue is wonderfully lush and deep, almost irresistible at present. Château Daugay is soft and forward. Certainly there is plenty of joy to be had here in 2017 across the range of wines owned and managed by the de Boüard family. The following detailed notes were taken following tastings on Sunday, 8th April, 2018 at Château Angélus. I hope you find them useful. Mid red/purple; dark at centre; not as tight to the rim as Angélus below; lovely open nose; violets; plums; lovely pain grillé tones with ripe plum lift; nice seam of fruit; nice entry; sweet but layered with lovely cool fruit and violet notes; this works really well – one of the most forward Carillons I’ve had from memory. Quite intense; impressive; inky finish. Some chew and coffee on the back end. [90% Merlot, 10% Cabernet Franc]. Tasted 8/4/18. Drink 2023-2035. 92-94.